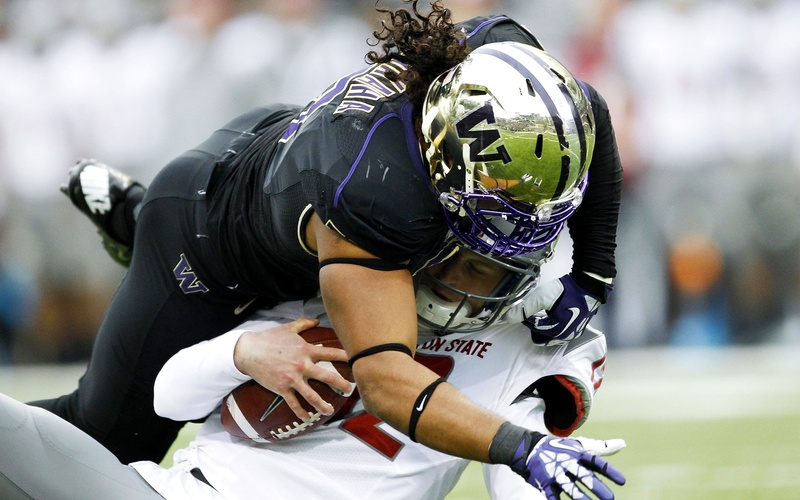 The New Orleans Saints needed an Edge rusher, and in the 2nd round of the NFL Draft, the Saints got the high-motor, high-revving Hau’oli Kikaha from the University of Washington. Kikaha (6 feet 3, 246 pounds) led the NCAA in sacks with 19 in 2014 and ranked second in tackles for loss with 25. Kikaha marks the 4th Husky player to be taken in the Draft: Defensive Tackle Danny Shelton, Linebacker Shaq Thompson, and Cornerback Marcus Peters were all taken in the 1st round. The Saints needing to revamp their entire defense but especially in pass rush–where the Saints ranked 25th in sacks–found some great qualities in Kikaha. Kikaha is not a one-hit wonder. In addition to his 19 sacks this season, he had 13 in the previous season. Kikaha likely will be a backup to Junior Galette, who tallied 22 sacks the past two seasons and is only one year into a hefty contract. Head Coach Sean Payton would like Kikaha to push Galette for a starting position, or use Kikaha on pass rush downs. Kikaha has the heart of an NFL player; however, he lacks the elite size / speed to be an all-pro. Defensive-minded Payton will put him in a position to succeed as a pass-rush specialist, but long-term Kikaha’s injury history may catch up with him.